Hey, look! 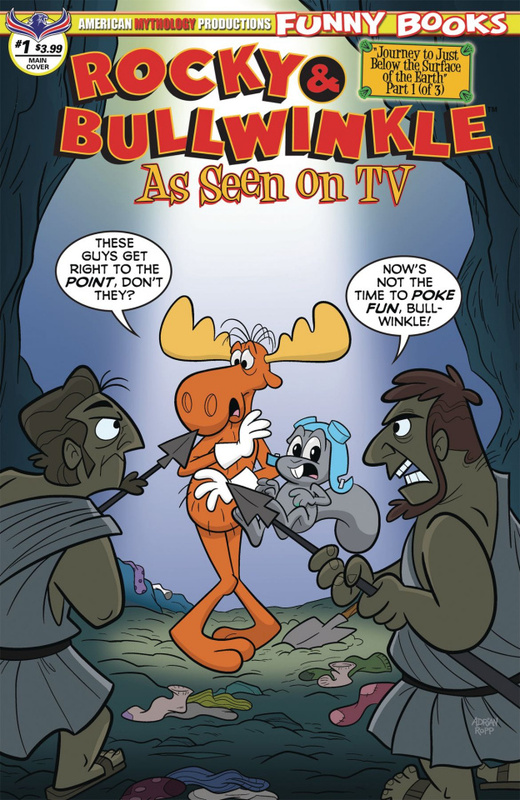 There's New Adventures of Rocky & Bullwinkle on that internetty TV thing, and they're right here in comics, too! It's the return of one of the smartest and funniest cartoon comics ever created, featuring our two favorite goofball friends and those no-goodnik spies, Boris and Natasha. Today's riveting episode is "Journey to Just Below the Surface of the Earth" in which Rocky and Bullwinkle assist a Wossamatta U archaeologist in discovering the lost city of Atlantis in the darnedest place, the first chapter of an incredible, three-issue epic! Then, Mr. Peabody and his boy Sherman travel back in time to inspire the sculptor Rodin, and Fractured Fairy Tales presents the story of the Ant and the Grasshopper! You'll get all this, plus a classic reprint adventure in Rocky & Bullwinkle As Seen On TV #1, available with three covers - Main by Adrian Ropp, Dudley Do Right by Jacob Greenawalt, and a 350 copy Limited-Edition Retro Animation variant.